Get ready to celebrate with Russell his triumphant year with this months release of his stunning DVD RETURN OF THE VOICE: LIVE AT THE ROYAL ALBERT HALL. 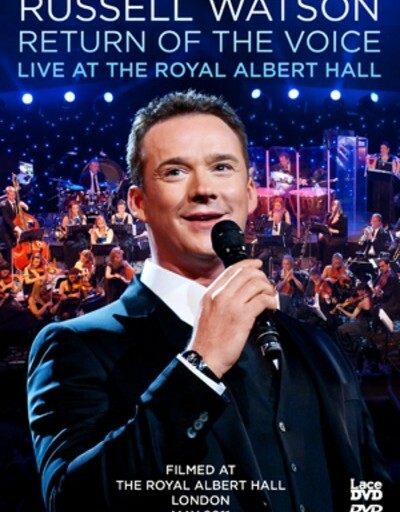 Charting one of Russells spectacular Royal Albert Hall concerts earlier this year, the DVD captures the singer before a packed audience of adoring fans. Beginning with powerful renditions of ‘Somewhere’ and ‘Be my Love’, Russell then takes the audience on a journey through an eclectic mix of West End inspired tracks Italian love songs, Frank Sinatra’s finest and, of course, classical favourites from over the years. The tracks include his emotional performance of ‘Ave Maria’ which he dedicates to his Grandmother who recently died. Return of the Voice: Live at the Royal Albert Hall is a DVD which reaches out far beyond the original core classical enthusiasts. The ambience amongst an audience of all generations is jovial and excited with the extra dimension of the Arts Symphonic Orchestra and The London Chorus Choir lending visual extremes to the concert.